The guns, which fire conventional bullets, could never be traced if used in a crime, because there's no serial number. WASHINGTON — Nearly half the states joined a series of efforts Monday to block a Texas man from offering instructions online for making plastic guns using 3-D printers. "These downloadable guns are unregistered and very difficult to detect, even with metal detectors, and will be available to anyone regardless of age, mental health, or criminal history," said Bob Ferguson, Washington's attorney general. His counterparts from Connecticut, Maryland, Massachusetts, New Jersey, New York, Oregon, and Pennsylvania joined in preparing to file a lawsuit in federal court, seeking to stop the website from making the instructions available. 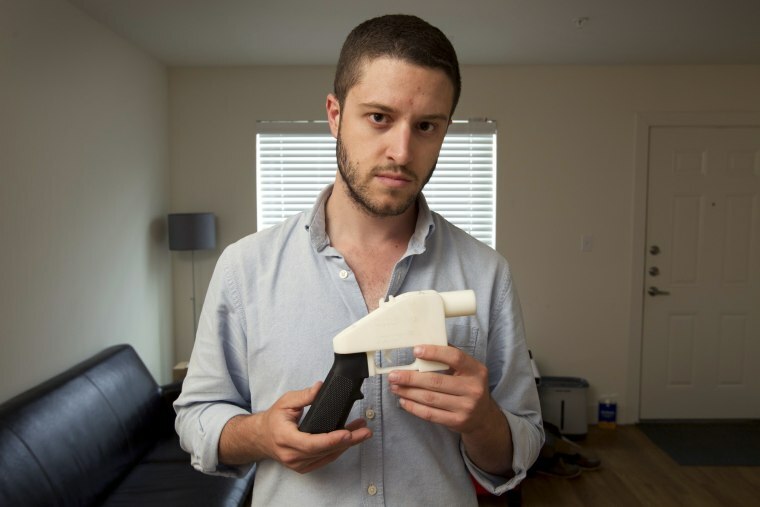 Cody Wilson of Austin began posting the directions over the weekend, after the federal government dropped its opposition and settled a lawsuit that prevented him from making the files available for download. When fed to a 3-D printer, they allow a user to make the parts necessary for assembling fully functioning handguns or rifles. Under the Obama administration, the State Department sued Wilson, saying his plans would violate laws against exporting firearms technology by putting the instructions into the hands of hostile forces or terrorists. He sued, claiming a violation of his right of free expression but federal courts ruled against him. But then in June the Trump administration abruptly reversed course and concluded that rules limiting exports of weapons of war don't apply to Wilson's guns after all. "To say they caved would be an understatement," Ferguson said. Wilson's website promised to begin posting the instructions Wednesday, but he started making them available shortly after he received formal notice of the federal government's approval late Friday. Attorneys general from 20 states wrote Monday to Attorney General Jeff Sessions and Secretary of State Mike Pompeo, urging them to revoke permission for the downloads. They say the government's current position is "deeply dangerous and could have an unprecedented impact on public safety." The list of states included six with Republican governors — Iowa, Maine, Maryland, Massachusetts, New Mexico, and Vermont. Pennsylvania and New Jersey each sought separate court rulings to block the downloads by their residents. Advocates of gun control said the instructions make homemade guns available to anyone in the world. "If you are prohibited from having guns because you have a lengthy criminal rap sheet, multiple felony convictions, you'd never be able to pass a background check in a gun store. But you can make your own," says Adam Skaggs of the Giffords Law Center to prevent gun violence. The guns, which fire conventional bullets, could never be traced if used in a crime, because there's no serial number. And plastic guns could more easily slip through metal detectors. But some gun rights supporters say it's unlikely criminals would bother trying to make their own guns. David Kopel of Denver University's law school says, "I think it makes little practical difference in the Unites States, because with a black market, people who shouldn't have guns are still able to buy them anyway."